Owning a healthy planted tank depends a great deal on how well you have created a base inside the tank. To create the perfect base you need the best substrate for planted tank. A substrate is basically the key factor which can give you the perfect planted tank. It is used at the bottom of the aquarium where your plants spread their roots. If you don’t own a good substrate then you will find a lot of difficulties to grow beautiful plants and as a result, you will have an unnatural aquarium. Different companies have different types of substrates, in terms of chemical compounds or other characteristics. Finding the best one can be a little confusing for anyone. Therefore, we have come up with this article where we will be reviewing the top 5 substrates which will assist you to create a healthy planted tank. Later we will talk about all the necessary information you need to know regarding substrate. So, stay tuned! Before we jump into the details let’s take a look at the best available options in the market and their particular specialties at a glance. As our first pick, we have an excellent option for you if you want to plan different kinds of plants in your aquarium. This is the ADA Aqua Soil Amazonia which is highly popular among people. Mr. Takashi Amano, who is considered as the father of nature aquarium, founded ADA (Aqua Design Amano). 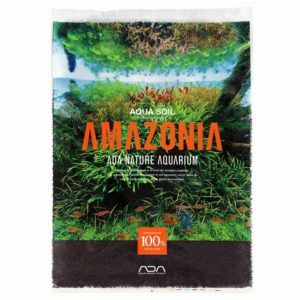 So there is absolutely no doubt about the quality of ADA Aquasoil Amazonia. 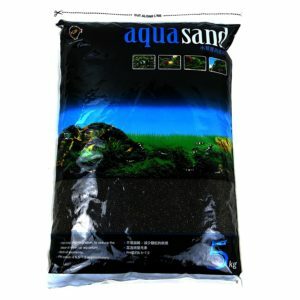 This aqua soil has several benefits and has designed to provide the best natural substrate to your planted tank. Whenever you are using a substrate you have to make sure it has an optimum PH level. For most plants, the level is between 5.5 to 6.5. This ADA Aquasoil will help you to have this perfect PH level in the soil. It keeps the pH level low and a low pH level is really helpful for the plants to absorb nutrients more easily. The best thing about this substrate is that it is fully natural. According to the manufacturer this substrate has made with material 100% from the earth. Therefore, the soil you are using is high in nutrients and totally safe for your aquatic creatures. When you are using a natural substrate this results in a healthy root system and you get a healthy planted aquarium. This ADA Aqausoil also helps to keep the water clean as it doesn’t make the water cloudy like garden soil. It also softens the water. One thing to remember, as this substrate lowers the pH level and also makes the water soft which is really good for the plants but some fishes requires high pH. So keep this in mind while choosing your livestock. All in all, ADA aqua soil Amazonia is a great choice if you are going to plant high demanding and nutrient-hungry plants. As our second choice, we have the Eco Complete Planted Black Aquarium Substrate. 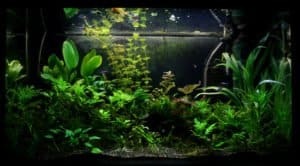 This product is a great substrate to use for freshwater and it has almost all the necessary elements required to have a beautiful planted tank. While using this Eco Complete substrate, you don’t have to use any other type of chemical or extra substrate. Not only the name, but it is actually a complete substrate for your aquarium. The Eco Complete substrate has included a formula in their product which enhances the development of the roots. The company advertised their substrate as good as the soil of Costa Rica or Hawaii. Now we cannot actually say about this, whether it is actually that good or not, but we can say that this substrate has got more than 25 important elements like calcium, magnesium, potassium, iron, sulfur and many more. All of these elements make sure your plants are having a good soil to grow. This substrate contains a high percentage of spherical grains. This also contains a Heterotrophic bacterium that converts the waste into natural nutrients. This same thing happens in any natural water body. So, you can understand that this Eco-Complete substrate is going to maintain an organic biological balance in your aquarium. It establishes an environment, where all the waste and nutrients are cycled, so your plants grow nicely and also the fishes remain safe. Before using this substrate confirm the pH level of your fish tank and then use the required amount of it. Our third choice couldn’t be anything other than the UP Aqua Sand for Aquatic plants. It is a great combination of price and features for you. If you buy it in shipments like most people do, you will get around 4-5 bags in one shipment which is more than enough for one go. 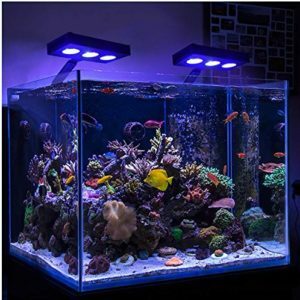 Therefore, people who purchase in bulk and deal with big aquariums find this product especially helpful. The best part about UP Aqua is the sand pit. The unit is super easy to plant and you wouldn’t even feel that you are dealing with dust though the whole thing is dusty. One big alarm for those who look for completely black unit is that it is not completely black. There are grey shades within it if seen under the lights. Let’s talk about the grains now. They are one of the finest shapes available out there. The grain is solid and you will not have any issues of replacing the unit in one or two years. The soil is very easy to manage and the black grains actually add more beauty to the plants. As mentioned before, the unit is not that dark compared to some of it’s competitors and that might be something that you want to keep in mind. All in all, this is definitely something that would want to buy, especially if you have a big aquarium. A black color substrate which is going to perform in all kinds of aquarium is the Seachem Flourite Black Substrate. This is basically a clay-based product and the clay gravel is great for tank plants. The main advantage of this product is that you don’t have to replace it. It has a very long lasting life. You can keep away the tension of changing substrate again and again while using the Flourite Black. 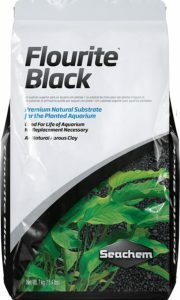 The Seachem Flourite Black Substrate does not contain any harmful elements. It is also great to use if you want to keep the pH level low without affecting the entire water quality. While keeping the pH level perfectly, it does not soften the water. It is high in iron, but it lacks some of the essential nutrients. Therefore, if you are going to plant some delicate roots in your aquarium, we think this won’t be a good option. 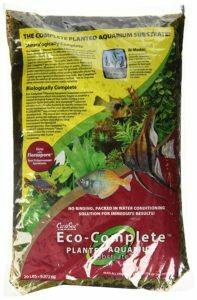 Apart from this issue, this substrate alone is enough to provide all the nutrients which are essential for your aquatic plants. You don’t need to add any extra nutrient substrate or any kind of gravel modifiers to get the best result. This product assists to keep the water clean. The food and fish waster layer on the substrate and therefore the water remain cleaner. One important tip of using the Seachem Flourite Black substrate will be before you add it to the water, you need to clean it. Otherwise, there is a chance it will discolor the water. For our last pick as one of the best substrates for the planted tank is the Fluval Plant and Shrimp Stratum. Now from the name, you can guess that this product is not only for plants and fishes but this is the perfect buy if you have shrimps in your aquarium. With lots of amazing benefits, this substrate is the right choice for all your aquatic animals and plants. 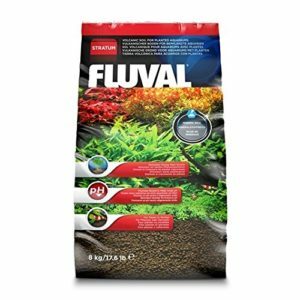 First of all, the Fluval Plant and Shrimp substrate is made of all natural soil. Not only organic but it claims it is made up of volcanic soil. Volcanic soil is different than normal soil; this type of soil contains more special nutrients than the normal one. These special elements of the soil will ensure root development and will create a healthy environment for your plants and also for the shrimps. The texture of this Fluval substrate is also really good. This is a porous and light soil. Using this will help you to grow nitrifying bacteria in your tank which assist to maintain the biological filtration in your tank. One special feature of this substrate for which it is suitable for shrimps is the size of the particles. The size is large enough where the baby shrimps can hide or can easily take place. This hiding place is really important for the shrimps while their growth stage. So all in all this is a great substrate for all kind of tropical fish and obviously for plants to grow and create a beautiful atmosphere. Let’s first think one thing, if you want to build a beautiful garden what is the most important thing you need? Good soil, right? So when your garden needs soil, if you want a healthy planted tank then you have to give it something where the plants can grow and therefore the importance of using substrate is immense. Now the benefit of having substrate in aquarium is not only limited for the plants, there some other advantages for which you should use a good substrate in your tank. Some of the benefits are discussed below. When you are using a substrate it works as a medium to create different beneficial bacteria. Now these helpful bacteria are really important to be present in the water to maintain the nitrogen cycle. In natural water bodies, like ponds or rivers there is presence of different types of bacteria and these converts the waste into foods. Different types of substrates contain these bacteria which can do this organics breakdown in your aquarium. Therefore, using substrate means creating a more natural environment for your aquarium. Next, benefit that you will get from using substrate is it will help you to keep the water clean. No matter how well filtration system you are using, the water is going to get dirty. However, if you are using a high quality substrate then it will keep the waste at the bottom layer of your tank and the water will remain clean. There won’t be no floating of dirt in the water and the water will be less polluted. Adding substrate in your aquarium creates a more familiar environment for your aquatic animals. In rivers, oceans or even in ponds there are mud, sand, pebbles, rocks and so many other natural materials. Obviously these things are missing in your aquarium but when you use a substrate it creates almost the same living environment for the fishes. Even some fishes like shrimps need to some places where they can hide or for snails where they can bury themselves. Your aquatic animals can also sit at the bottom rather than floating in the water all the time. So for all of these reasons you should use substrate. Last but not the least, the best benefit of using substrate is that it is a great source of different nutrients. There are different kinds of substrates available in the market. Different substrates contain different elements and thus different qualities. Using a substrate according to your need you can provide essential elements which are required for the plants and also for the fishes. For example, potassium, magnesium, iron, sulphur and etc. keeping pH level at an optimum level is also very important and you can do that by adding special type of substrate. Moreover, if you need to soften the water even then you can use substrate. So mainly for growing plants in your tank you must use substrate which works as a soil for the plants. But you can see there are some other great benefits of using it and therefore you should go for one which is suitable for your need. There are many varieties when you are going to buy substrate for your tank. There is a variety of elements, color, texture, quantity, and material. Before you buy one you need to understand the different types of substrates which you can purchase. Below we have narrowed down some of the popular types of substrates for you. Avery common substrate used by people for their aquarium is sand, especially if someone is a beginner. Now the normal sand and aquarium sand is a little bit different, therefore you have to buy those sands which are made especially for use in the aquarium. Using sand works very good if you own fishes that like to dig into the sand and bury them. One major problem of using sand is that for the very small particles it can easily enter to the filters and therefore cause problems. One of the most popular substrates for an aquarium is gravel. The reason why it is so popular is for its simplicity. It is easy to use and can work for different types of aquatic animals and for different types of tanks. Now just like the sand, aquarium gravel and normal gravel is different. The gravel which is used in an aquarium has smoother edges. For this reason, these don’t cause any harm to the fishes. Moreover, these come in different colors and size that gives you more options to decorate your tank. This type of substrate looks almost like soil because of its color, either this is grey or black. This soil substrate works as well as sand or gravel. Compared to sand soil substrate contains more nutrients to your tank and therefore it is the best substrate for a planted tank. It provides multiple nutrients which are required to have a healthy planted tank. This soil-like substrate has many varieties; you have to find the perfect one for you. In our review section, we have mentioned about some soil substrates. If you want to grow plants in your tank and need something that gives the root development then you must go for a complete substrate. Some of the examples of the complete substrate are CaribSea Eco-Complete Substrate or the ADA Aqausoil Complete Substrate. Complete substrates will provide the necessary nutrients to your aquarium and at the same time, it maintains the nitrogen cycle. One very important thing to remember, while using any kind of complete substrate is that you have to add them before when there is no fish. After adding it, check the pH level and then add your aquatic creatures. Lastly, one of the most commonly used substrates in many tanks is marbles. Marbles are spherical and flat and these come in many different colors. Marbles have been used mainly to decorate the aquarium. Obviously, marbles don’t add any nutritional value to your tank, but many fishes love to sit on them. Because of the size, there is a gap created between the marbles and the foods can get trapped in this gap. Where this is a problem, on the other side some aquatic creatures love this gap for breeding purpose. Even these gaps keep the eggs safe from other fishes. So these were some of the basic and most common substrates that you can buy for your aquarium. Make sure you have enough knowledge about each of them before you make a purchase. To setup substrate for your planted aquarium first, you need to find out how much substrate and what type of substrate you need to use. There is no specific amount of substrate that one should use; it depends on the fish tank size and what look you want to give your aquarium. Now though there is no fixed amount of substrate for use, there is a minimum limit. No matter what type of substrate you are using it should not be lower than 1. One basic rule is for 1’’ bed you need to use 1 lb of the substrate. But the most important thing is that you have to keep in mind the pH level and the water characteristics while using any kind of substrate. Now when you have figured out the type and amount of the substrate it comes how you should setup it in your aquarium. We will now talk about how you can apply substrate for your planted tank. At first, clean your tank and then put the required amount of substrate into it. As we said earlier, it depends on your preference and taste. After adding the substrates then fill the tank with taped water. Secondly, you have to remember that each substrate is different from the other one. These are different in chemical compounds and nutrients. Therefore, you have to wait at least for 1 week before you add fishes in it. By this time all the nitrite and ammonia spikes will occur in the water and that will create a more natural and suitable atmosphere for your aquatic creatures. Moreover, you will get to know how the substrate affects the water. Even if you are using a completely natural soil, you have to give this time. Finally, now after 7-8 days when your water and the substrate are completely ready to use you can add your fishes. You can go for different plants to plant in the substrate. Add them according to your wish and you want to decorate them. Different types of plants will give your aquarium a more natural looking vibe and it will increase the beauty of your tank. How deep should we put the substrate in our aquarium? It depends on the plants you are embedding. If you are planning for deep-rooted plants then those will require more depth of the substrate, otherwise, the roots won’t develop properly. For deep-rooted plants, you need to use at least 2-3 inches of substrate. So depending on the roots you will require the depth of the substrate. What is the main purpose of substrate? The main reason for using substrate for planted tanks is to give the plants the nutrients and elements that it requires. Apart from this reason, for water chemistry, to keep the pH level optimum, for filtration and also to give your aquatic creatures a more natural familiar environment you should use substrate. Using different types of substrates are also used for decoration also. What is the meaning of aqua soil? Aqua soil is a kind of soil which is rich in organic nutrients and mainly made for aquatic animals. This type of soil is considered as one of the best substrates for planted tanks. Basically, there is one brand Amazonia Aqua Soil substrate that is suitable for the aquatic plants. 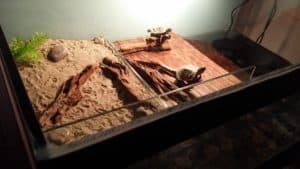 Should we choose sand or gravel as a substrate? We think, using gravel is a better choice. First of all, they come in different sizes and colors so you can easily customize and it is more suitable for freshwater than sand. On the other side, using sand can create problems for the water flow and also in the filtration system. However, some fishes like goldfish really love to dig into the sand and bury them. So to give a more natural feeling to the fishes you can use sand. Power sand is different than normal sand. Actually it doesn’t even looks like sand rather like gravels. This type of sand contains nutrients which are necessary for aquatic plants. This power sand also promotes the growth of different beneficial bacteria in the tank. What plants should we use in the tank? You can use different types of aquatic plants in your tank. 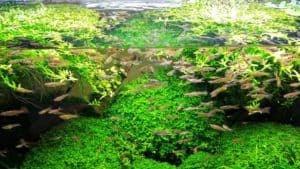 Some of the most used plants and also work good for the fishes are Water Sprite, Hornwort, Moss, Fern, Frogbit, Dwarf Anubias, Anacharis and some more. How to clean the tank while using gravel? There are certain steps that you need to follow while cleaning the tank if you are using gravel or any other type of substrate. First, take a bucket and fill it half with the dirty water. Then place all the fishes in that bucket and now unplug all the electric wires. After that drain the whole tank completely and take away all the gravel from the tank. Once the inside part is cleaned, clean the hood, glass, tank top and also the outside part of the tank. How to adjust the pH level? One of the common methods to increase pH level is to use baking soda. Use 1tsp. baking soda per 5 gallons. For reducing the pH level you can use peat moss in your filters. There are some substrates available which can also lower the pH level. Don’t make any sudden change in the pH level. Hope you have got all the required information about substrate from our article. We know it is not easy to choose the perfect one from so many options with so many characteristics. We have just tried to give you an idea about it. 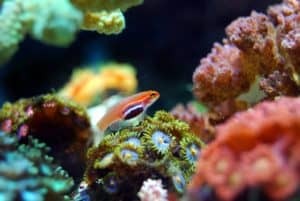 The best substrate for planted tank depends on many things, like what types of plants you want to have and also what types of fishes you are keeping in your tank. Also there are other factors like choice of LED lights, pressurized CO2 system, fertilizer dosing etc. You just need to keep in mind that, the substrate you are choosing should provide the required nutrients, a perfect base for your plants and can also create a great look to your aquarium. ECO-COMPLETE IS AN INERT SUBSTRATE, IF YOU AREN’T DOSING FERTILIZERS, YOUR PLANTS WILL DIE. HAVING USED THIS PRODUCT, I CAN SAY IT ISN’T THE GREATEST PRODUCT TO WORK WITH, GRAIN SIZES ARE LARGER MAKING IT DIFFICULT FOR FINER CARPETING PLANTS TO FILL IN, AND IT IS VERY OVERPRICED FOR AN INERT SUBSTRATE. SECOND – THE AMMONIA RELEASED BY ADA’S SOIL IS ACTUALLY VERY BENEFICIAL FOR YOUR PLANTS AND HELPS CYCLE YOUR TANK. YOU SHOULDN’T ADD FISH UNTIL THE TANK IS FULLY CYCLED, BUT THIS IS REALLY THE CASE FOR ANY TANK WHETHER USING ADA OR NOT. THE AMMONIA IN ADA MAKES YOUR FISHLESS CYCLE EASIER. THIS PLAYS IN TO MY THIRD POINT – YOUR TANK WILL NOT CYCLE IN A WEEK. NOT USING AN INERT SUBSTRATE, NOT USING ADA, AND MAYBE NOT EVEN WITH ECO-COMPLETE. CYCLING REQUIRES SIGNIFICANT BACTERIAL GROWTH IN YOUR FILTER, SUBSTRATE, AND AQUARIUM SURFACES THAT TAKES SEVERAL WEEKS, POTENTIALLY LONGER. IF YOU’RE SERIOUS ABOUT KEEPING FISH SAFE FROM AMMONIA AND NITRITES, BOTH OF WHICH ARE VERY HARMFUL, GOOGLE “FISHLESS CYCLE” FOR MORE INFO. FOURTH – IF YOU PLAN TO USE A BUFFERING SUBSTRATE LIKE ADA AMAZONIA OR FLUVAL STRATUM AND YOU HAVE HARD WATER, YOU’RE GOING TO RUN INTO PROBLEMS. THESE SUBSTRATES ARE BEST PAIRED WITH DISTILLED, RO OR RODI WATER. IF YOU HAVE A WATER SOFTENER, YOU’LL WREAK HAVOC ON THESE SUBSTRATES TOO. THESE SUBSTRATES REMOVE CARBONATE HARDNESS AND RELEASE HUMID ACID TO BUFFER DOWN THE PH. IF YOU USE WATER WITH CARBONATES, YOU’LL RAPIDLY EXHAUST THE SUBSTRATES, RUINING THEIR ABILITY TO BUFFER. FINALLY, A NUTRITIOUS SUBSTRATE IS NOT NECESSARY FOR SUCCESSFULLY GROWING AQUARIUM PLANTS. SUCCESS CAN BE JUST AS EASILY ACHIEVED BY DOSING THE WATER COLUMN WITH THE NECESSARY FERTILIZERS FOR PLANTS TO THRIVE. AQUATIC PLANTS CAN TAKE IN NUTRIENTS THROUGH BOTH THEIR LEAVES AND ROOTS.